bloomington, indiana : the owlery. the chicago diner (post coming soon!) is a chicago vegan/vegetarian staple. i absolutely love it there. it's sad that not everyone (in the world) has access to this fantastic restaurant. however! bloomington, indiana residents now have the owlery, a new (-ish) vegan/vegetarian place located right near the downtown square. per their website, "the owlery offers high quality, vegetarian food at affordable prices. at the owlery, we challenge ourselves to find responsible sources for our ingredients and ethical ways of doing business." you may notice that it does not say "vegan/vegetarian" on the description. that's okay, because i know the vegan part is true. during my last visit to bloomington, i didn't have time to fully partake in the vegan delicious-ness offered by the owlery. i did have time for some cupcakes. wow. 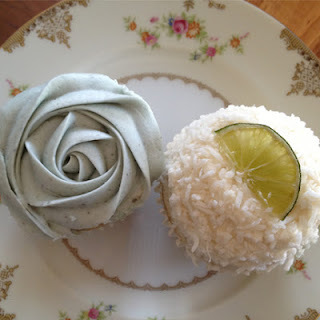 aren't these the most beautiful vegan cupcakes you've ever seen? the frosting on the lavender cupcake was awesome. so unique & tasty. the cake part was a little dry, but that's ok. the coconut lime cupcake was overall delicious. i loved the coconut flakes ... and there were little bits of lime baked right into the cake. yum. i also had a slice of carrot cake from the owlery, but it got a bit mushed up in transport. the carrot cake? um, wow. sooooo good. it didn't have a traditional vegan cream cheese frosting flavor. just super sweet-ness. these little cupcakes were such a tease ... i can't wait to head back to bloomington to try the rest of the owlery's menu! cabo san lucas, mexico : mi casa restaurant. cabo san lucas, mexico : la golondrina.